Old dog learns new tricks! As an experienced dive centre owner and working instructor I have worked with dozens of instructors over the years and thoroughly enjoyed being taught by Garry Dallas. Garry has a very laid back and informal teaching style but don’t let that fool you. The class room sessions, kit rigging, and predive briefings are very thorough and no question is ignored. In the water Garry has limitless amounts of patience and can seamlessly switch from student to student, analysing skill faults and making corrections. His own demonstrations are clear and succinct which ensures that the majority of the dive is spent practicing rather than watching him. The low instructor to student ratio guarantees that Garry misses nothing and you leave knowing that you have achieved a level of competance that you wouldn’t have thought possible in four dives. Although the course is biased towards Garry’s passion of cave diving, the skills are very relevant to other types of diving – especially photography. The icing on the cake was the day after the course – no back ache from carrying and diving with my twinset! I can’t wait to get back in and put it all into practice. Anyone want to buy a set of manifolded twin 10’s? Arriving for the classroom study I was put at ease straight away. We went through our history of diving and our future hopes and dreams. My dream was to progress and learn to be a great Sidemount Diver. Garry went through the equipment used and the pros and cons of sidemount and to be honest they were mostly all positives. A few are having your cylinders to hand for easy access in an emergency. Also the trim you can keep throughout the dive in changing the position of the cylinders by the sliding D-rings…….and many more. Arriving at the great Capernwray dive site on the Saturday, it was quite cold. But Garry got straight to it and set up my new Diamond harness, teaching the basics from putting on the harness to correctly setting up my new side mount regulators. Garry encouraged us to try different ideas to see which technique and what parts of equipment would suit my sister and me in the best ways e.g. trying the 6m bungee instead of 8m for the gradual dexterity needed to attach cylinders with ease and proficiency. Garry was very patient and helpful. In the water I was able to get to grips with 11 litre aluminium cylinders, which I fell in love with and by the end of the weekend was detaching them and bringing the cylinders in front of me. I loved the freedom that the sidemount cylinders allow you. Day two we learnt how to flutter breathe a cylinder, which is a great way to conserve air in a free flow situation. We were taught how to deal with out of air situation and with the long hose given to your buddy, helped with controlling the situation with ease. We were taught emergency bungee replacement and different finning techniques for different environments, this was all great fun. I even logged my longest dive time yet to date, as we didn’t want to get out of the water. Then Garry was taking us through the 4 dive scenarios, which we did very well with the great guidance we had received. 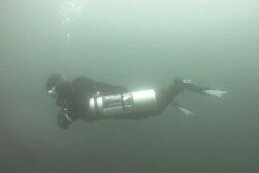 By the end of the weekend I was rearing to do a pleasure dive. I felt confident and competent to dive side mount. I can’t wait to wear my ‘Simply Sidemount by Garry Dallas’ T-Shirt. 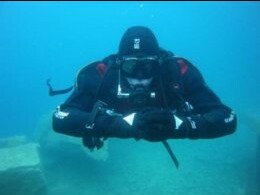 ……I feel awesome I have gone down the route of sidemount diving. It not only allows you plenty of air and redundancy, but it also looks great too in and out of the water. I feel I could not only look after myself in an emergency with the ease of the cylinders being at my side, but also to have my buddies know I am well equipped to help them as well. It’s a piece of mind for all. Looking back at when I was getting my new harness out of the box and not knowing one end from the other, I now am able to be self efficient and look after my buddies too. I feel my diving has taken a new dimension. I can’t wait to get back in the water with Garry again, to enhance my abilities further. To make sure we carry Garry Dallas’ name with pride and confidence. First and foremost I would like to say a huge thank you on behalf of Karen and myself for the excellent way you delivered the lecture on Friday evening. We were very impressed with the actual presentation and also the time taken by you to make sure we fully understood the ways and where fores for the instruction given. We were very thankful also that apart from the bare facts you elaborated constantly, to ensure that we were fully conversant of what was required of us to enable us to be proficient in all the techniques required in sidemount. Without the proficient way in which the instructions etc were given and the time taken, we would not have been able to have gained the proficiency that we feel we have acheived. Karen and myself cannot wait to dive our sidemounts and carry on the skills and expertise you have given us. As a recently qualified PADI and SSI instructor who had just undergone back surgery I was keen to discover if a sidemount configuration would help me lugging around heavy equipment during my own recreational diving. 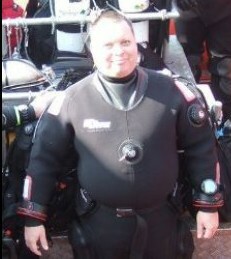 I researched providers of sidemount courses and settled on Garry Dallas’s PADI distinctive specialty offering. The main reason for choosing Garry was I wanted to be taught by someone who was passionate about the sidemount configuration and who dived regularly in that configuration. The pre-course communication was accurate and efficient. Garry would return emails or telephone calls promptly and all queries were answered. Garry and I planned a one-2-one course, settled on a price and put firm dates in the diary. A deposit was paid and all was agreed. The first morning of the course was held in the hotel I was staying at and covered the evolution of the sidemount configuration, equipment selection, set-up and configuration, and progressed onto demonstrations of rigging the cylinders and harnesses. I had to practice this dry until both Garry and myself were happy. So then it was off to Capenwray. A few minutes were then spent with dive site briefings, signing in and orientation. Then it was time to get wet. Our first days diving covered basic skills, trim, out of air, air management and fining techniques. It was a late end to the day so off to a local establishment for refreshment then bed. Overnight I had a few queries and requests for Garry and after meeting early on day 2 we discussed these matters. Garry was very flexible in his approach and was able to accommodate my requests to try out alternative entry techniques and some additional cylinder removal and replacement practice. The second day also covered more out of air practice, more safety skills and some scenarios. I will not spoil the scenario fun element suffice to say this is a challenging part of the course. 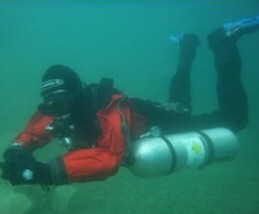 Overall the course is demanding but covers a great deal of sidemount related skills. Garry is an enthusiastic diver and teacher. He is patient, caring and understanding. My biggest tip for choosing a sidemount course is to research the instructor carefully. There are many who offer instruction but make sure you get an instructor who lives and breathes sidemount configuration. 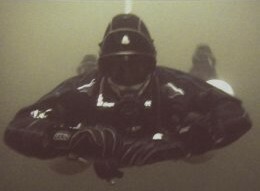 I first heard about sidemount diving during a brief presentation organised by my local dive club about a year ago. I liked the sound of the benefits, many of which seemed fairly common sense and although a fairly inexperienced diver I pretty much decided then that it was the way forward for me. 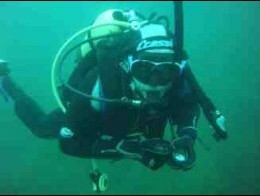 As my UK dives began to get deeper (only 30m!) and having read a bit about out of air scenarios, redundancy came to the fore-front of my mind and so I decided to go for it. 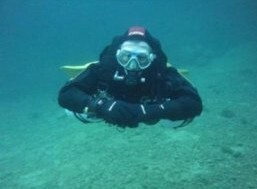 Having searched around a bit it seemed that a lot of courses were being offered by only recently qualified sidemount instructors..not all that confidence inspiring for me I’m afraid and so I found Simply Sidemount and Garry on the internet, checked out his references and signed up. A decision I’m glad to say I most definitely don’t regret. Myself and my fellow student were given equal attention and given extra time and help as necessary on the skills we needed that little bit of extra practice with. Our mistakes were very tactfully pointed out and discussed and the use of video was a great visual aid to this. Right from the outset helping me set up my kit before hitting the water, through to the final scenario dive where Garry pushed us a bit with what we had learnt I felt instilled with confidence that my tutor new exactly what he was talking about . I now have a lot of practice to do (particularly with the reverse fin kick which I can’t believe Garry kept a straight face at!) but I’m gonna have a hell of a lot of fun doing it and with massively increased confidence in my kit and my abilities. Cheers Garry – nice one! From the moment I began learning to dive it has become a passion that has only continued to grow the more I have entered the water. However, a continuing problem that I faced was the difficultly in carrying the weights and cylinder on my back, both above and below the surface. I struggled to complete two dives in a day without having persistent backache during the dive and sometimes also the day after. My desire to dive for longer and to deeper sites, also lead me to consider air consumption and the requirement for more air. 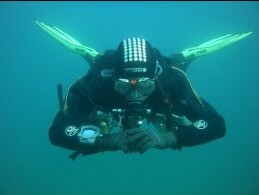 I learnt to dive with Garry late last year and had seen him dive in sidemount configuration several times. I always thought it looked like the closest thing to freediving with a cylinder, which also allows increased air supply and removes weight from the back, so I decided to give it a go. When I did my first dive in sidemount I had less than 50 dives and I was worried that I would not be up to the challenge at what seemed like a much more technical way of diving. I can’t deny I was also highly sceptical about my ability to carry the weight of two cylinders and with having quite a small frame it can be difficult to place weights. Garry’s infinite patience and knowledge proved to be invaluable. What makes Garry an instructor that is a cut above the rest, is that despite his vast knowledge and experience, he still believes he can learn something from each student and has the ability to tailor a course to an individuals needs. He took the time to ensure that the kit and weights were configured correctly for me and I was surprised to find that, despite my small stature, in sidemount configuration I can carry 2 x 10L cylinders quite easily and also need hardly any extra weight. Moving the cylinders to the side removed the backache problems instantly and left me with a huge feeling of freedom under the water. The course itself is challenging but well worth it. I can honestly say I have never felt more confident, relaxed or safe underwater. I feel self-sufficient and able to deal with any scenario. Throughout the course Garry is very intuitive to each individuals needs and will try his best to accommodate you in any way possible, whilst also maintaining a high standard and ensuring you are fully competent at each skill. 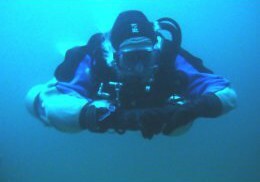 He is full of different ideas and techniques that enable everything from kit configuration to performing skills, to become easy and efficient for everyone, including a relatively novice diver such as myself. Once the course is complete it is great to know that for Garry it doesn’t end there and he is always willing to lend a helping hand, whether that be advice on kit or general dive practise. He makes diving look effortless and represents a standard of diving to aspire to and as an instructor I can’t recommend him highly enough! I wanted to say thanks I’ve just got back from Cape Verde where I took some time to dive. These were my first dives after finishing the Sidemount course with you. The course really helped, not only did I learn the new skills associated with Sidemount but as I have said I learnt a lot about my abilities as a diver. Diving in Backmount on vacation (I haven’t got my sidemount wing yet ;-)) For the first time I felt complete confidence in my own ability in a very accomplished group. Despite many of the divers having completed more dives than me. I was in many ways diving better than them. My buoyancy was outstanding even if I do say so myself. Having dived for a number of years, I was looking for a different style or form of diving to allow me to progress my skills beyond what i suppose people would generally call ‘standard recreational diving’. I didn’t fancy rebreather, and had tried various wings and twinset configurations, and they just didn’t match up to what I’d hoped, so my search continued. 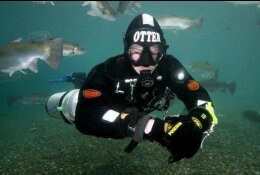 Sidemount as an option soon emerged. Being a BSAC OW instructor, my initial reaction was that I wished to explore this option via my own training agency, unfortunately however Sidemount is not yet ‘recognised’ by BSAC and no courses are available. Based on recommendations and research, Garry became the obvious choice. 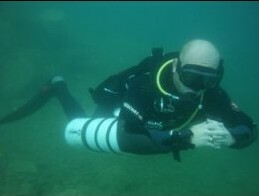 Initially due to much of the hype I’d seen in various magazines and forums I was sceptical that SM wasn’t just a passing “fad” and found it hard to believe that (my first thoughts) “just strapping cylinders to my sides” would make such a difference to diving from how I had previously experienced it. I telephoned Garry to organise a try-dive, and was instantly taken by his very apparent love and faith for this style of diving. If someone can convey that over the phone then I knew it must be something special, and the day before my birthday I found out that it indeed was! From transporting kit to the shore before the dive, though to kitting up, completing the dive, the trim and freedom were amazing and getting out too, without my knees buckling but still having two cylinders which is what i wanted to do, to increase my dive time. I took to it instantly, it was all so much better than I’d experienced in ‘traditional’ back-mount be that single or twin cylinder. Watching Garry under the water too further demonstrating what one day I could eventually hope to do in Sidemount further wetted my appetite to continue to investigate this way of diving. I just had to experience more, so organised to complete the course with Garry. (would I be bad for admitting that at this point, I was already so hooked and convinced that I’d been out and bought all the kit AND also convinced my partner who was also looking for an alternative to backmount, (another BSAC instructor) who hadn’t previously tried Sidemount to do the same?!? 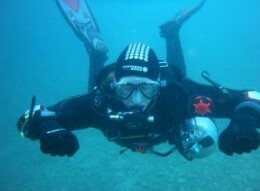 – yes, so good was the sidemount experience and Garry’s expert tuition, that is exactly what id done. I hear you thinking ‘must have more money than sense’ honestly that is not the case!) So the test was on, I was already hooked, would my partner be too, and would he take to it in the same way as I did? Some of the skills are much different than back mount and he was at first having some difficulties, the point being that Garry had several different approaches to master a skill if the first suggestion or demo didn’t quite ‘click’, his patience and reassurance to us both, knew no bounds, and what needed to be done and learned was – the shut down drills, finning techniques and safety drills etc, it was ‘nailed’ , Garry made sure that they were fully understood, and completing them was not just a ‘one off’ fluke in passing the skills, we were competent and comfy, both we and Garry knew it otherwise he wouldn’t have passed us. As instructors this too was a refreshing change to see and experience because as many fellow divers know, it can sometimes be the easy option for an instructor to say ‘you did ok’ – this doesn’t really do much for your confidence if you are honest to yourself, you aren’t fully confident, comfortable or competent in the skill and it shows, so rather than going away and trying to get it right yourself, you do it with the instructor, which is just how it should be if you ask me! it is also no good as an ‘ambassador’ for the sport or style of diving (admit it – we all look at other divers when we are in the water and pass judgement on what we see, bad buoyancy and trim, poor kit configuration, whatever it may be) Garry clearly wants people to pass and dive in Sidemount because its a fabulous way of recreational diving and also opens up so many other more advanced diving techniques and adventures (our next with Garry being The Cave course) but he doesn’t want this at the cost of making his (now our) style of diving look clumsy or idiotic or impact on his own reputation as an instructor in turning out ‘bad students’. So, yes the course will test you and you will have to get it right, but the challenge makes it even more rewarding when you succeed. (Even during the relative stress of completing course examination dives, my SAC rate was still lower than when I’m in back mount) Of course you will learn and hone your skills when you’re diving alone, but you will certainly leave Garry with all of the basic skills you need to experiment and safely enjoy your new style of diving. All of our recreational diving is now done in Sidemount, we keep the back mount for instructing our students. Best advice I can give, ‘try it and you may never go back’ (pardon the pun!) also don’t select an instructor who hasn’t got any TRUE Sidemount diving experience, and has just done the course to meet demand at their local dive shop, find someone who can truly give you the whole picture and do the style of diving justice, you’re cheating yourself if not. I have to say I was very sceptical about Sidemount at first, Lindsey had been going on about it for months. She then did a try dive with Garry and was hooked. We arranged to do the course with Garry and after a very thorough lesson on Friday night in our B & B we were ready for the diving to start. As the dives and skill development progressed I was getting more into it. I did struggle to do the skills whilst maintaining my buoyancy at first, my main problem was adjusting to diving using my suit for buoyancy. Having spent the last two years using my BCD it was not easy. Trying to master the new finning techniques was much harder than I’d anticipated especially reverse finning, I could visualise how to do it but I couldn’t get my legs to cooperate. Garry had us lying across the tables outside the cafe practicing dry runs trying to develop some muscle memory. I did eventually move backwards even though it was only a few centimetres. I will keep practicing until I am proficient. I went into dive four thinking I would never get it but Garry was extremely good at picking out the positives and motivating us, me in particular. What a challenging dive!!! I coped very well in the end and in a strange way enjoyed the experience. I was really pleased when he said we had both passed. We did a fifth dive and without the pressure of the course to think about began to appreciate what it was all about, streamlined profile in the water, conserving air and energy, fin strokes to minimise silt disturbance. All great skills to have and satisfying to master. I’m finally getting to see the point. A month later and armed with our own kit (we couldn’t train in our own because like many current sidemount harnesses ours were not CE approved) we met up with Garry again and he helped us to configure it. 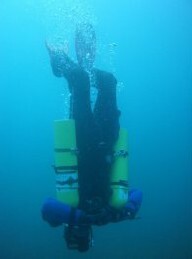 Then went on to do a couple of recreational dives. This is when all the pieces fell into place for me, we went into and under wrecks squeezing through gaps that we hadn’t noticed before. By the time we finished I was converted, I’d had an awesome time and was grinning from ear to ear. Thanks Garry for your patience and an insight in to the many aspects of your exceptional teaching methods. I have learned so much that I will be using from now on both while diving and teaching. The desire was to dive in caverns and do it in sidemount… A chat with Garry and we were on. After one evening in the classroom we were off to Capernway. Land drills, line laying, primary ties, secondary ties, blacked out mask , lost line drills, lost buddy. 3 hours later and only when Garry was happy, we were in the water . The rest, well i think its better for you to experience it rather than me tell you a story. We did 5 dives and 3 were in caverns. All I can say is that after the cavern diving course, I feel a much more competent and safer diver. It was one of the best Padi courses I have done, thanks to the excellent tuition from Garry. If you are thinking of doing a course and haven’t made your mind up yet, well look no further. I started diving in 2006 and love it. However most of my buddies have progressed onto twin sets full time. Watching these people struggle with manhadling these twin sets to / from boats or from shore dives in choppy seas was enough to make me look for an alternative. I used to just rent/borrow twin sets up to now. I wanted to join my buddies on longer dives but didnt want to be the cause of cutting the dives short as I would only have a single tank and a stage for dives if there wasnt a twin set available. Along came sidemount diving and Garry Dallas. From the first reply I got from Garry re my enquiry I knew I had a good instructor. This was confirmed on our first meeting at the sidemount workshop. Garry was very informative and explained all to us in his presentation. The next two days Dimitrios (the other student,a pleasure to learn with ) and myself were amazed at Garry’s skill in the water. Garry made sure he passed on as much info and skills to us as he could in the time we were with him. Indeed this was put to the test in the scenarios in the fourth dive, even then Garry thought we could improve and in again for a fifth dive. Garry was then happy and we were chuffed , two of the dives being eighty odd minutes. I would recommend this course to anybody not just people wanting to go technical but also for divers who would like the increased safety of two independent cylinders. Im selling my 15 litre and getting two 7 litre tanks for my local shore dives . Thanks Garry for a great course! I’ve been interested in sidemount since I stumbled across a video of Steve Bogaerts showcasing it in August. It looked strange to me, but cool… so naturally I wanted to do it. Also I read that it is very helpful to people with back trouble. To anyone who knows me (particularly the BUSAC dudes at uni) i haven’t shut up about it. At the start of the course, i had a few issues maintaining my profile and relying on my breathing alone for buoyancy control, however Garry with his seemingly infinite patience and expertise talked me through where i can improve, and within minutes of being in the water again my profile had improved greatly. I thoroughly enjoyed the course, it was good to do something completely new again and go through basics. Seeing Garry in the water was pretty awe inspiring, perfect profile and trim which comes from a very high level of skill in the water. Which in turn comes from a very deeply seated passion for Sidemount, and diving in general, something which left me in complete confidence of Garry’s instructor abilities. 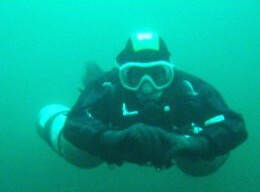 To anyone looking to do something new with diving, try sidemount, to anyone wanting to progress further up the ladder of diving, give Garry a call he’s a fantastic instructor and a very caring individual. The use of video on the course was invaluable in pointing out areas of improvement, i learned a lot from the experience, and found even more areas where i can improve on, which adds to the joy of diving. Each dive followed on from the previous one, until the final dive where everything you have learned is brought into play, followed by a very pleasant dive for the remainder. I now have a hunger for wrecks and similar environments where i can bring my sidemount skills into play, I encourage you to try for yourself. I’ve been quite happy with 2 cylinders on my back and on deep dives 1 or 2 side slung for travel / deco gas. It took 301 dives before I experienced a free flowing regulator, and thankfully it was on a side slung cylinder on which I feathered the valve for about 10 mins before it freed the sticky 2nd stage (maybe I should get them serviced more often!). This experience highlighted the inaccessibility of a valve behind your head and sparked a desire for sidemount. Thanks to Garry’s excellent coaching and the simple fact that sidemounting is more balanced and streamlined, my conjoined (12 Litre) twins have undergone extensive surgery and I have a manifold for sale! Thanks Garry for excellent course its not a PADI card buying exercise for sure! 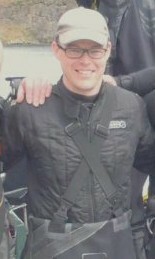 I would like to take this opportunity to thank you for the Sidemount Speciality course that you ran in August 2011. I first heard about sidemount from an article in Sport Diver magazine about two years ago and the concept intrigued me. I normally dive with a single back mounted cylinder, but have tried a twin set, however could not get on with the extra weight and valve shut downs. I wanted to do the same sort of diving I do but safer with addition of extra redundancy. I went to a presentation by Steve Martin which was a wealth of information not only explaining Sidemount but also helping me make a decision on the way I wanted to dive. When I finally got both the time and money to do the Sidemount course Garry was recommended to me as an instructor. 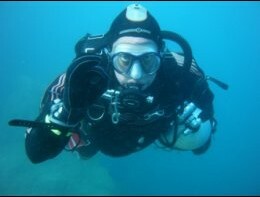 Garry had been taught by Steve and used Sidemount as his everyday diving. I found the course was run in a nice relaxed manner yet allowed enough time to go through all the skills taught on the course. The presentation / classroom work was well balanced and gave reason to how equipment is rigged and why as opposed to the usual we do it this way because we are told to, it was also good to have other options talked about such as how you would rig and use say a Razor Harness as opposed to the Hollis Wing that is used on the course. The dives gave chance to practise new skills and each progressive dive built on the skills from the previous dive. The diving was fun and the skills put into a real dive context as opposed to just knelt on a platform. I liked the way that all the skills were done while hovering in a horizontal position, that helped my buoyancy skills no end. Garry uses in water videos and photo’s throughout your training sessions to help show your under water position and at the end of each dive we sat down and reviewed these. Not only is it great to get personal feedback but also very useful to see how to do the skills. I got my own harness a couple of months before my course which gave me a chance to try it out. I did about 4 dives in the kit before my course and although it felt very comfortable it was clear after just 1 hour in the water with Garry that I had not got the configuration correct. After the course Garry got the harness fitting correctly, and helped me tweak my set up. 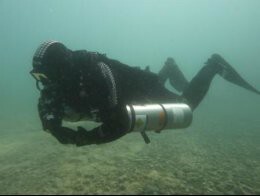 Sidemount is much more comfortable than either single with BCD or manifolded twins and far easier to run shutdown drills than with a twin set. There is no substitute for quality training, and having an expert watch and correct your mistakes. Garry’s support doesn’t stop at the end of the course either. He offers to review and assist in ironing out any issues you may have post the course. Thanks again for a great course and all your help. Soon as I saw some videos on the internet of Sidemount diving I had to it. 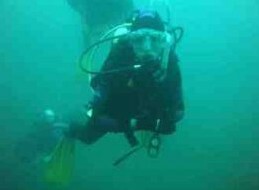 So I went to my local dive centre and they then introduced me to Garry Dallas who could offer me a course and a qualification, so I jumped at the opportunity. With a class room presentation to familiarise with the equipment it only excited me further and couldn’t wait for O/W weekend. Garry presented certain skills I had to do, from setting up the equipment correctly to swimming technique’s. And after 4 dives I finally mastered the skills that were put before me. As a PADI OPEN WATER SCUBA INSTRUCTOR I found that Garry presented the Sidemount course very thorough in the classroom presentation and at O/W. When Garry is talking you can see his passion in Sidemount Diving show, which makes his course very enjoyable. At O/W he was very patient as he pushes you to be better as a diver by showing you some videos of your technique which was very beneficial. Not only is Garry telling you how to improve on your dive he is also showing you. SIDEMOUNT DIVING IS THE FUTURE!!!!! Close on the heels of Katy and Darren’s sidemount diving experience, we couldn’t wait to clip our cylinders to our harnesses and see what all the fuss is about. Now you’ll be glad to hear that I’m not going to go over the same stuff that Katy already has already covered, so if you missed her blog on sidemount be sure to check it out! I’ve been wittering on about how good sidemount looks as a diving technique all year; and was really excited about giving it a whirl. Katy and Darren really enjoyed their sidemount sessions and their post experience enthusiasm did nothing to reduce my excitement! First up we were joined by Jo and Simon for a group evening of kit configuration, sidemount diving philosophy, plus discussion of general pros and cons of sidemount diving (we definitely came up with a lot more pros than cons); then after a couple of sleepless nights we were off to Capernwray for a weekend consisting of 4 dives and lots of skills. We were under the expert tutelage of Garry Dallas for the course, and spent lots of time working through the various skills involved in safely taking maximum advantage from the sidemount configuration. All skills were carried out whilst maintaining neutral buoyancy and good trim position, which I was a little nervous about – as this was obviously a first go in new gear- but with a little concentration we both managed to avoid embarrassment. The thing which stuck in my mind the most about diving sidemount was the balance of the gear in the water, this allowed us to dive in any orientation we liked – swimming along on our sides laughing hard enough to flood my mask, or swimming upside down under the wing of the plane! Both Paul and I had a blast learning to dive sidemount and can’t wait to get out and do more! 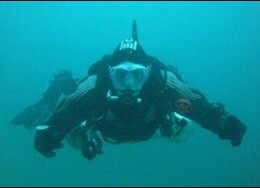 After seeing Garry demonstrate Sidemount first hand in the sea off Anglesey, I decided that it was the way forward for me. I’m not a PADI diver so this is as unbiased as it gets really. I won’t lie, I did find it hard but that’s only because I have been on a twinset for the last 8 years and my signals are different from the padi ones. But that aside , Garry is one of the best instructors I’ve ever dived with he’s very patient. I would recommend this course to everyone no matter what their dive background. I’m more than pleased with the course and Garry’s strict standards. I look forward to doing more with Garry in the future. Why carry heavy gear about?? Garry took Jay and myself through the course. The Skills and Drills he teaches should be learnt by everyone interested in safer diving. Learning new skills is rightly a challange and Garry is very good at explaining and demostrating them. 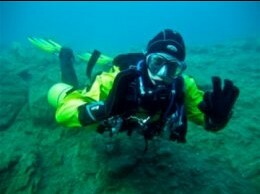 I advise everyone to do the course and especially the Dive 4 senarios !! Freediving without the hassle and expense of surgery for the addition of gills! If you are reading this, then it’s fair to say you are on the path to becoming sidemount trained and your here asking why Garry Dallas then? Garry is passionate about diving, he will make you feel more than welcome and train you to have the confidence in the system you are using. He makes it fun. He will make sure that you can dive the system, have fun with it and be more than safe using the new skill set. You’ll be explaining to others how brilliant and safe the sidemount configuration is to others in no time at all. It doesnt stop at the course. Garry will help with further enquiries, always updating the skills and helping adjust your equipment to your own configuration as time progresses. You’ll quickly find, that not only have you acquired new skills, but a new friend passionate about diving! What are you waiting for? Get signed up. Now!! “From the moment you meet Garry, you quickly realise that SCUBA Diving is not just a hobby but an exciting way of life. Whilst teaching you, Garrys enthusiasm and experience is infectious; this coupled with his unquestionable professionalism (His credentials really do speak for themselves) makes Garry the best instructor you could ever wish for!! He provides a fun, friendly and unforgettable experience whilst maintaining high standards of safety & excellence. WOW cheers Garry for a awesome two days in Capernwray. After diving twins for 7 years I didn’t think sidemount would be so much easier and fun. I felt it all came so naturally after only the first few minutes in the water. Brilliant demonstrations and explanations of the skills that we would be performing. I would recommend 100% everyone go sidemount with Garry Dallas, Plain and simple. Out with the back breaking Twins, in with the Sidemounts !! ‘From the moment I got into the water with Garry, I felt safe and comfortable and I knew I was going to have an amazing introduction to diving and the underwater world. His vast experience and knowledge of the sport is obvious and his genuine enthusiasm and enjoyment shines through into his teaching. Garry is the type of person that will go above and beyond to ensure that you have the most fantastic dive experience possible; I don’t think any other instructor would be as thorough or patient, whilst making the learning experience so much fun! To put it simply, learning from Garry is learning from the best and I will definitely be continuing my diving journey under his guidance. 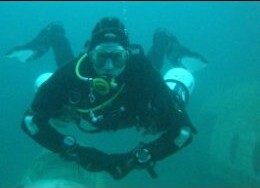 Over the last three years I have been trying new types of diving to mentally prepare myself for any eventuality underwater for when I started my training with the Royal Navy as a clearance diver. After a couple hundred dives with Garry, you can’t help notice his true Passion for sidemount diving which is reflected through his teaching and his need to improve and perfect himself and his students. Although I class him as a friend, When he’s teaching courses he keeps to high professional standards, showing endless patience and excellent skill instruction. Ive continued my education and guidance with Garry passing my Divemaster, Sidemount and Cavern courses. With the skills I’ve learnt, I will hopefully find them usefull in my new career with the Royal Navy after my professional training has been completed. Just want to say thanks for every moment underwater to the big man himself and all the best in the future. Been diving a long time! I have been using sidemounts for a couple of months and was slowly getting to grips with them. I’m sure that, given time, I would have eventually become fairly competent in sidemount use. However, I decided to accelerate the learning process and booked myself on Garry’s three day course. I was so glad I did. During the first half hour of the practical day, I learned so much that this in itself justified the cost of the course. Don’t be misled, this is not the usual industry standard “do the drill once and qualify” type of fast turnover course. Garry quickly identifies your strengths and weaknesses and steers the course accordingly. Personally, this provided a massive confidence boost in knowing that I can deal with various situations that would dismay many divers. Garry’s wealth of experience in diver training and cave diving shows through in this excellent course.